What’s It About? If you’re thinking the name sounds familiar then you’re right – Low Winter Sun was originally a Channel 4 miniseries back in 2006. Remakes are always risky, but taking a two-part miniseries and turning it into a fully-fledged multi-season idea is certainly ambitious. Numerous questions are raised as to whether there’s enough storyline to stretch it over a longer period of time, and if the idea will translate well to an American audience. Sometimes original shows are best left untouched, yet others find ways of improving ideas and bringing something different to the table. Shifting the story to Detroit, Michigan in the United States, Low Winter Sun focuses on the same core idea – one cop who kills another in such a way that he fully believes he’s going to get away with it. Interestingly Mark Strong takes on the same role as he did in the original, Detective Frank Agnew, the murderous cop who used to play by the rules but now lives on the edge constantly. Strong was by far the best thing about the minseries and so it’s a pleasure to see him take up the role here again. 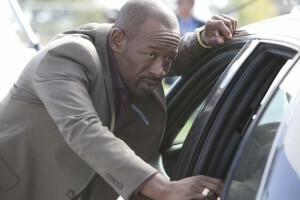 Strong is joined by Lennie James, familiar to most for Jericho, The Walking Dead and recently UK drama Line of Duty. James is a popular actor on both sides of the pond, and always brings his A game to the table. James plays veteran detective Joe Geddes, a cop just a little shadier than Agnew who never quite lets on as to what side he’s playing for. Geddes is a guy you’d keep an eye open while sleeping, and who you’d always try to keep on your side wherever possible. He definitely appears to have one foot in some rather dodgy circles and could influence Agnew in any number of ways. Their relationship is based on the lies of covering up a murder and either one could blow at any time, making Low Winter Sun a tension-filled story, and in which you’ll wonder who’ll be first to crack. Verdict: There are points where you feel Low Winter Sun may be a little too ambitious in stretching out the plot for more episodes than the original, yet both Strong and James’s acting is more than enough to keep your eyes glued to the screen from start to finish. It’s a slow burn so don’t go expecting constant action and drama, as this is a character study in deception, where you get dragged into a messy situation and wonder how everyone will get out of it. While Strong and James are the highlights of the cast, they’re joined by James Ransone from The Wire and Generation Kill, Sprague Grayden from Jericho and Ruben Santiago-Hudson from Castle among others. The two main leads certainly aren’t left to carry the show themselves, and sub-plots work well with those involved. Compared to other similar network shows, Low Winter Sun falls somewhere between The Killing and Breaking Bad in terms of quality. It certainly doesn’t hit the highs of the latter, but it has great potential and it’s a show where the scripts are always strong even if the viewing figures aren’t. Extras: Unfortunately there’s a real lack of extra content on the set. It would have been interesting to learn more about adapting for a US market or even just about the Detroit area. Final Words: To any fans of the original worrying about how Low Winter Sun would translate to an American show – Detroit speaks for itself. It’s a wonderful setting for the story with a perfect mix of gritty darkness and a homely feel that represents the light and dark to the main characters. It’s not the next break-out hit and a second season isn’t guaranteed, but there’s enough here for ten episodes, especially Lennie James who manages to once again prove he’s one of the best on TV. A show full of doubt, intrigue and questionable morality, Low Winter Sun is a decent addition to any drama fan’s collection, and one that works even better watched in a few sessions rather than patiently waiting week on week on TV. Don’t go in comparing Low Winter Sun to The Wire and The Shield, but judge it on its own merits and it’ll be far more enjoyable. 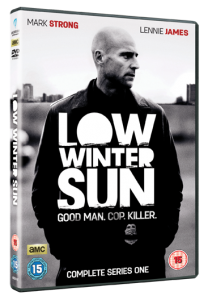 Low Winter Sun is out on DVD now.